However not all of the 737 is built at Renton. The fuselage has always (except for the first seven prototype fuselages; l/n 1-5, 7 and 9) been built in Wichita and brought to Renton by train. Also much of the sub-assembly work is outsourced beyond Boeing. When the fuselage arrives at Renton, it is fitted with wiring looms, pneumatic and air-conditioning ducting and insulation before being lifted onto the moving assembly line. Next, the tailfin is lifted into place by an overhead crane and attached. Floor panels and galleys are then installed and functional testing begins. In a test called the “high blow”, the aircraft is pressurised to create a cabin differential pressure equivalent to an altitude of 93,000 feet. This ensures that there are no air leaks and that the structure is sound. In another test, the aircraft is jacked up so that the landing gear retraction & extension systems can be tested. As the aircraft moves closer to the end of the line, the cabin interior is completed – seats, lavatories, luggage bins, ceiling panels, carpets etc. The final stage is to mount the engines. According to Boeing, there are approximately 600,000 total parts on a 737NG. The present build time is reducing from 11 days (5,500 airplane unit hours of work) towards a future target of 8 days (4,000 airplane unit hours of work). The production rate has increased from 31 aircraft a month in 2005 to 42/month in 2014 and is scheduled to reach 57 aircraft a month by 2019 for the 737MAX. Boeing are looking at ways to further automate the production processes to either allow the line to run faster in a specific area, or free up mechanics to be deployed elsewhere. Boeing CEO, Dennis Muilenberg, said in October 2017 "Our planned production rate for the 737, going to 57 per month in 2019, is based on our backlog of over 4,400 aircraft and a production skyline that is oversold through the end of the decade. We continue to assess the upward market pressure on the 737 production rate." i.e. he may further increase the 737 production rate. There have also been talks of reaching 60 per month by 2020 and 63 by 2021 to reduce "meltaway" of orders (cancellations) from the large backlog. After construction they make one flight, over to BFI where they are painted and fitted out to customer specifications. It takes about 200ltrs (50USgallons) of paint to paint a 737. This will weigh over 130kg (300lbs) per aircraft, depending on the livery. Any special modifications or conversions (eg for the C40A, AEW&C or MMA) are done at Wichita after final assembly of the green aircraft. Auxiliary fuel tanks, winglets, SATCOM and specialist interiors for BBJs are fitted by PATS at Georgetown, Delaware as these are STC (Supplemental Type Certificate) items. On 12 Jan 2018 Boeing has announced that the 737 MAX programme reached a "signature moment" after the MAX 7, MAX 8 and MAX 9 aircraft all shared the "same production line simultaneously" at its Renton factory. Boeing has handed over the first 737 Max completed in the country to Air China. It was the first to be delivered outside the US by Boeing, although for all intents and purposes it bore a “Made in USA” label. It marked the debut of Boeing’s plane completion and delivery centre in Zhoushan, 140 kilometres southeast of Shanghai. The completion part of the facility is a joint venture with state-owned Commercial Aircraft Corp of China Ltd. Chinese workers at the new plant will put the finishing touches on US-built planes flown over from a Seattle-area factory, before delivering them to local customers. “This is a really exciting point in our history to have something of this scale here,” said John Bruns, president of Boeing China. “It really demonstrates our commitment to this market,” he said of the Zhoushan facility. About one of every four jets that Boeing builds is bound for China, while the country’s airlines are the biggest buyers of the 737, the manufacturer’s largest source of profit. China is expected to need about 7,700 commercial airplanes over the next two decades to connect an increasingly mobile middle class. Indeed, the plane delivered to Air China was even painted in the US since that part of the Zhoushan facility isn’t yet operating, while the tasks completed onsite for its interior made for a “pretty limited work statement”, Bruns acknowledged. Handing off light manufacturing to the new completion centre eventually will free up valuable capacity as Boeing charts 737 production increases well beyond the 57-month rate set for 2019. The company only builds the narrow-body jets at a single site in Renton, Washington. A new production line will be built this year in Sheffield, England for parts for 737 and 777 gear systems and flight controls as part of a move to bring more production in-house. Boeing has a long-established association with Sheffield University's Advanced Manufacturing Research Centre (AMRC). Boeing will spend $25 million on a 25,000-square-foot facility in Sheffield will work closely with Boeing Portland, a company Center of Excellence for complex machining, gear systems and flight controls. The Sheffield plant will employ about 30 people when it opens, Boeing said. Boeing Vice President for Supplier Management, Kent Fisher said "For these particular actuation systems it made sense to have greater capability in-house and addressed affordability issues with the supply chain...The existing supply base was not providing us with the affordability we needed to stay competitive, there is a performance issue in the supply base and they were unable to meet production rates. Also, we feel for the long term it's important that having internal capability is essential to our success." then to 52 in 2018 and 57 in 2019 are still planned and on track, despite the skepticism of some industry observers that future demand might not support the higher volumes. And even at that eventual rate in 2019, Muilenburg said, the company remains “oversold” on the 737. Boeing currently has a total of 4,452 orders for all variants of its 737 aircraft included in its unfilled backlog. "Simply put, this is a big attractive market and the 737 family's position within it is solid," Muilenburg said. 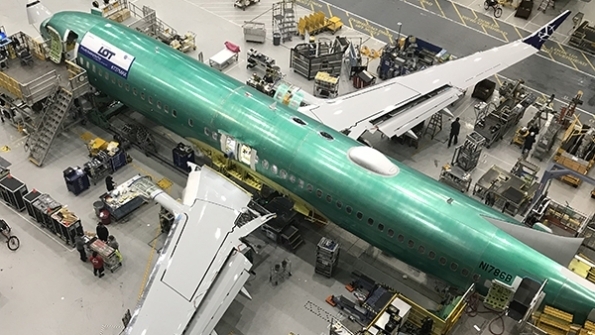 As the first 737 Max 8 test aircraft moves the pre-flight phase, Boeing now has one-third more production capacity in the 737 final assembly centre in Renton, Washington. The first product to emerge from the newly-opened “central line” gives Boeing more flexibility to respond to Airbus’ recent decision to increase A320 output to 60 aircraft per month before 2020. In a different way, “going higher” was exactly how Boeing created extra capacity in Renton’s densely-packed facility. Whereas Airbus spreads final assembly across four production lines scattered across Europe, China and the USA, Boeing concentrates 737 final assembly under a single roof with two hangar bays named 4-81 and 4-82. Each hangar has contained a single assembly line with an adjacent feeder line running alongside. To establish a third assembly line, Boeing consolidated both feeder lines into a single, three-level vertical structure called the systems integration tool inside the 4-82 hangar. On the top two floors, workers install wiring and electronic systems inside completed fuselages nestled into nine available positions, with three positions each dedicated to one of the three assembly lines. The lowest floor holds the build-up stations for major sections, such as the stabilisers and nacelles. 13 Mar 2015 - New Panel Assembly Line introduced for building wing panels to reduce 737 assembly time. SEATTLE, March 13 (Reuters) - Boeing Co has started using a new automated system to build wing panels for 737 jetliners, an important step in preparing to hit record production speeds while introducing new models of the popular plane. The robotic system, known as the Panel Assembly Line, or PAL, this week drilled holes and installed rivets for the wings of a production aircraft, the first such use of the system since installation began last summer, Boeing officials told Reuters during a visit to the Renton, Washington, plant. PAL replaces older-generation machines that drilled the panels, but left workers the task of installing rivets, a laborious process that led to occasional injuries and defects. PAL is designed to cut injuries in half, slash defects by 66 percent and reduce production "flow" time by 33 percent - all on half of the factory footprint. Its start-up was widely awaited because the 737 factory accounts for two-thirds of the planes Boeing makes and PAL will help enable the company to boost production. Inside the factory, a 60-ton, blue machine, looking something like a futuristic car wash, glides silently on hidden rails over a wing panel held in a jig. With a quiet "hiss" the machine zips holes into the metal wing panel and installs rivets, connecting pieces known as stringers to what will become the bottom surface of a wing. Five machines, made outside Seattle by Electroimpact Inc, have been erected in the plant. Boeing will install eight in total, with a ninth as a spare. They replace older machines made by Gemcor, based in West Seneca, New York. 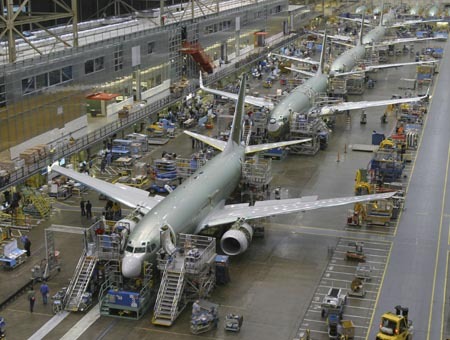 Boeing's two assembly lines in Renton make 42 of its 737 jetliners a month in competition with the Airbus A320. Boeing plans to increase that to 47 and then 52 a month by 2018. This summer it will open a third line that will start making the newest version of the plane, the 737 MAX. Boeing plans to start building the first MAX in August and finish in November. Boeing has not publicly confirmed the production schedule for the 737 MAX. The fuel-saving model will enter service in 2017. When the third line is running, Boeing could in theory produce 63 of the single-aisle planes a month, 21 from each line. Industry sources have said Boeing is gauging the ability of suppliers to handle 58 planes a month. Boeing declined to comment on any plans beyond its announced target of 52. A freak transport error threatens to derail Boeing 737 production temporarily, raising questions once more about supply chain vulnerabilities as commercial aircraft production rates climb ever higher. Boeing was still evaluating as this article went to press the impact of a train derailment in Montana on 3 July that dislodged six 737 fuselages en route to final assembly in Renton, Washington, from the Spirit AeroSystems factory in Wichita, Kansas. Montana Rail Link, the railroad company involved in the derailment, had recovered three fuselages that had slipped down a steep embankment into the churning Clark Fork River. Pictures from the scene showed the three fuselages had sustained severe damage. Boeing was still assessing the extent of the damage and how it will impact a production system that rolls-out six completed 737s every three working days at current rates. It is a system designed to accommodate a minimum of disruption from a globally scattered supply chain, with parts flowing into Renton by air, sea and rail. Spirit, which Boeing divested in 2005, builds 70% of the 737 – the forward and aft body, nose section, nacelles, pylons, vertical fin, horizontal stabiliser, flaps and wing-to-body fairing – at its sprawling production facility in Wichita. Spirit ships the complete fuselages – lacking wings, landing gear and most systems – by train to Renton. The freight cars pass through Kansas City, Nebraska, Wyoming, a journey of nearly 2,000nm (3,700km) through mostly remote plains and wilderness. The latest derailment is the most significant disruption in modern memory. In 2011, a tornado dislodged two 737 fuselages from a train passing through Nebraska. The following year, damage caused by another tornado closed Spirit’s factory in Wichita for a week. Somehow, the storm ripped off a section of the factory’s roof, but did not cause any damage to the fuselage structures lying below. Spirit took several weeks to fully recover, but never missed a “load date” for a 737 fuselage in Renton. The latest incident again highlights Boeing’s heavy reliance on Spirit for a 737 product line in a market segment with unprecedented demand. Boeing plans to raise 737 output again to 47 aircraft per month in 2017, a 12% jump from the current rate of 42 every month. At current production levels, two assembly lines in Renton each complete one 737 roughly every working day. Boeing is opening a third line in 2015 in the same factory to build the 737 Max, creating capacity to more than 60 aircraft per year. The fuselages were crushed and baled a few weeks later. A local scrap metal company brought out a portable baler it uses to crush cars, and turned the six 737 bodies into large metal cubes. Boeing will boost 737 production to 47 aircraft per month in 2017, the latest build-rate increase the manufacturer has announced on its narrowbody line. Boeing began producing 38 737NGs per month early this year and the rate is expected to rise to 42 per month in the first half of next year. By 2017, when the company is scheduled to deliver its first re-engined 737 MAX aircraft, the 737 program “will build more than 560 airplanes per year and will have increased output by nearly 50% since 2010,” the manufacturer said. Boeing currently has more than 3,400 unfilled orders across the 737 family, including more than 1,600 orders for the 737 MAX. With the new target, Boeing would enter territory that Airbus isn't attempting. The output, from the same footprint at Boeing's 737 factory in Renton, Washington, will not only boost Boeing's cash pile, it will give the company more delivery slots to sell to airlines who want new, fuel-efficient planes sooner. "This is a big, bold, but very strategic move by Boeing," that follows recent competitive wins by Airbus that likely have been "more heavily price-driven than in the past," said Russell Solomon, an analyst at Moody's Investors Service in New York. He said Boeing can also be aggressive on price and now can talk with customers about new orders "with the very pointed message that they won't have to wait as long to get their greatly desired new equipment if they buy Boeing vs. the other guy." Boeing's rate increase was more ambitious than some forecasts. Carter Copeland, analyst at Barclays in New York, said he had penciled in Boeing building 46 737s a month around 2018. "I definitely didn't expect an announcement on it so soon," he said. While Copeland said he didn't have major concerns about the 737 supply chain keeping up with higher rates, he said producing so many of the current 737s and the 737 MAX "would seem somewhat challenging on the surface." He added, "I'm sure the supply chain is quite pleased as the 737 is a profit leader for essentially everyone who's on it." Boeing Commercial Airplanes Vice President Beverly Wyse said in a statement that the higher rate would "lay a solid foundation as we bridge into production on the 737 MAX." In contrast to the Boeing target, the chief executive of Airbus this week reiterated plans to hold its production rate of competing A320-family aircraft steady at 42 per month, saying the European company had some concerns about the fragility of the supply chain. Rob Stallard, an analyst at RBC Capital Markets, said Boeing's move "might give Airbus reason to accelerate" its production beyond the 42 a month. Airbus' output for narrow-body jets is based on an 11.5-month production calendar, implying average capacity for 483 aircraft like the single-aisle A320 a year. Boeing president and CEO Jim McNerney said he sees “a clear path” to raising 737 production rates above 42 airplanes a month as 737 Max 8s begin to supplant current-generation airplanes on its assembly lines in Renton, Washington, and its share of the market for its re-engined narrowbodies reaches equilibrium with that for Airbus’s A320neo. Speaking during his company’s second-quarter earnings call last Wednesday, McNerney wouldn’t concede any need to price the Max more aggressively to gain a 50-percent market share, despite the fact that the A320neo has outsold the Boeing product by some 800 aircraft. Boeing plans to reach a monthly rate of 42 by next year’s second quarter. Airbus reached that plateau during last year’s fourth quarter, but it has announced no plans for further increases. Notwithstanding suggestions that Boeing and Airbus have already created a market “bubble” with their aggressive rate hikes, McNerney cited potential “pressure” for further increases assuming the world economy holds form and other “variants” remain in place. He also said he sees no particular internal barriers at Boeing to meeting that demand. “Rate breaks are never easy, but we see a clear path to execution there and we’re assessing the scenarios right now of how and where we would do that,” added McNerney. Whatever it decides, Boeing won’t risk disrupting the introduction of the Max, schedules for which now call for entry into service in the third quarter of 2017, as much as six months earlier than originally planned. Last week Boeing announced that it completed firm configuration of the 737 Max 8, marking the start of the detailed design phase. Boeing expects to start final assembly of the 737 Max 8 by the end of 2015. Nearly 9 feet longer than any other 737, the new 737-900 is Boeing's challenge to the 185-seat Airbus A321-200. When this first 737-900 enters service with launch customer Alaska Airlines early next year, it will haul up to 177 passengers in a two-class configuration, with the range to go from coast to coast.